Fort Hamilton (2) (1791-1796) - First established in September 1791 by General Arthur St. Clair during the Northwest Territory Indian War. Named after the first U.S. Treasury Secretary Alexander Hamilton. Abandoned in 1796. Fort Hamilton was established in September 1791 by General Arthur St. Clair at the start of his campaign agains hostile Indian tribes during the Northwest Territory Indian War. The post was located on the east bank of the Miami River in the present day town of Hamilton, Ohio and was one of a line of forts established to protect supply and communications lines. 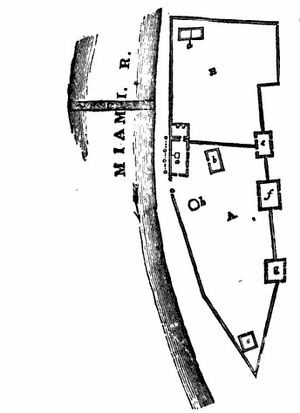 Fort Hamilton was originally built by Gen. St. Clair as a strong, rectangular, double palisaded work with bastions at each corner. The fort was later upgraded and expanded by Gen. James Wilkinson so that two of the bastions had two story blockhouses, the other two had artillery platforms and a third blockhouse was added. The interior of the fort included a firing platform around the curtain walls, log-built barracks lining three sides and officers quarters at the north end. Both General St. Clair and General Wayne used the fort in their campaigns and after the signing of the Treaty of Greenville on 2 Aug 1795 the fort was abandoned in 1796. Location: Hamilton, Butler County, Ohio. Roberts, Robert B., Encyclopedia of Historic Forts: The Military, Pioneer, and Trading Posts of the United States, Macmillan, New York, 1988, 10th printing, ISBN 0-02-926880-X, page 641. This page was last modified 21:02, 24 March 2019 by John Stanton. Based on work by Bill Thayer.